Years ago, I remember being shown a graph in geography class. This diagram displayed the topsy- turvy nature of the UK’s population – the fact that the number of people aged 65+ is outstripping the birth-rate. We were given nightmarish lectures on how this would lead to ‘unsustainable pensions’ and ‘healthcare collapse’; our teacher piling on the doom with almost evangelical vigour. The ageing population of the UK is a familiar issue to us all, and one that always seems to be presented in a negative light. The fact the 1 in 7 people in the UK will be over 75 by 2040 is not a statistic to be ignored, so should brands really be overlooking such a large proportion of the public as a drain on public resources, while they chase the favour of younger generations? Without negating the facts, it is clear that the discussion around the issue reflects a bias against age. In fact, age discrimination is now the most common form of discrimination in the UK. Almost 39% of employees recently polled by Lee Hecht Harrison Penna felt age was the most common cause of workplace inequality, even ahead of gender (26%) or employment status (15%). A great deal of this public perception of ageing can be attributed to the influence of brands. When it comes to selling, youth and energy remains the default focus in branding: from food and drink to cars and fashion. If packaging displays a photograph of a person, you can make an educated guess that that person won’t be over thirty. Brand messages stare at us from all angles, reminding us that youth is beauty, that youth is fun and any signs of age should be concealed and, preferably, forgotten. But this approach is bound to be short-lived. In the words of Patti Moore, “when we insist on categorising people as young or old…we create falsely conflicting camps for attention.” The days are gone when brands could hope to retain young customers for a lifetime, with a growing digital marketplace and increasing access to the web. Consumers are now savvier than ever, and therefore much better to switch brands for a better deal, regardless of any previous loyalty. High levels of technology use among younger generations and brand innovation around this also pulls focus onto millennials and away from older demographics. This perpetuates a stereotype that older people have reduced interest in technology, or ‘can’t handle it’ – something which, with the rise of ‘Silver Surfers’, is patently untrue. 90% of this group shop online, with 50% using a tablet to browse and buy. Let’s hope that, as politicians may be forced to re- focus on younger generations due to a high turn- out of young voters, brands will shift away from the ‘coolest’ audience to the most engaged. The older customers with bigger spending power; whose loyalty is still up for grabs? Perhaps what brands should be doing, is trying to attract an attitude rather than an age. Having grown up in post-World War II Britain, this generation has benefitted from the strengthening of the UK economy and are therefore in a better place financially than others, making them a prime target for brands. There are a lot of myths about this audience – that they are stuck in their ways, when actually they are open to opportunities because they have the disposable income and are at a point in their life when a lot of things change for them. Children gone and approaching retirement, many baby boomers find that they have the disposable income and leisure time that they have worked so hard for. Around 33% of them are now mortgage free since 2014 (having bought property when the market rate was cheaper) and putting off retirement until much later, relieving a major burden on their finances. The ‘Silver Surfers’ in particular, boast larger spending power than millennials, spending 1 billion pounds more on clothing last year than the 18-30s (despite the fashion industry’s obsession with youth). The trouble with the ‘grey pound’ is that this group of consumers are less likely to take risks, so are difficult to dissuade from their habits. However, if brands in the right sectors begin to cultivate their relationships with an older audience, a few categories stand to make an excellent profit. Health products and home maintenance, for example, are two categories where the senior consumer spends more per person than the average UK household. That said, there are a few brands out there that are considering their older customers when developing new products. Scandic Hotels invited staff in wheelchairs to test their hotels for accessibility, and uncovered issues that were keeping older people away. After refitting the hotel, and adding about accessibility information to their booking website, the chain saw a spike in visitors and made it to the finals of the World Responsible Tourism Awards that year. Likewise, while Ford was developing the Ford Focus, employees were asked to wear a ‘third age suit’, leading to the design of a more spacious, vehicle with more intuitive dashboard controls. At Honey, we have also noticed the benefits of tailoring design to an older audience, and thought carefully when working with this demographic on client projects. 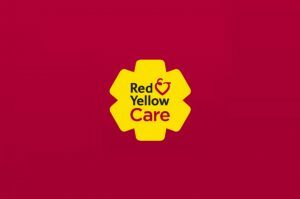 Our work for Red & Yellow Dementia Care, for example, took design cues from not only the company name, but researching the needs of the user. By using striking colour and strong graphical signage, we were able to clearly direct visitors around the R&Y campus, lowering visitor confusion and allowing for easier orientation. However, these examples only tackle one aspect – the physical aspects of aging and how it can affect the body. What brands still fail to address is the attitudes and opinions of 50+ people. Instead of treating them as individuals, with differing opinions to be catered to, it is as if their age is the only thing that defines them. What would really benefit brands would be to reassess the stereotypes associated with older people, and reap the rewards of meeting their specific needs and wants. The days are gone when brands could hope to retain young customers for a lifetime, with a growing digital marketplace and increasing access to the internet across the globe. High levels of tech use in younger generations and brand innovation around this also pulls focus onto millennials and away from older demographics. In order for age-positive attitudes to spread, a major shift will be necessary. Not only in how brands present age, but how they perceive it internally. 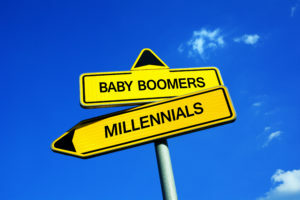 The design and advertising industries, in particular, have been singled out as ageist institutions, due to young workforces, and the fact that 95% of the briefs they receive are targeted at millennials. The perception of older people as inherently less able, or less interested in the ‘new’ holds brands back. To further illustrate the misconceptions of age in the creative industries, CEOs and Creative Directors across branding and advertising disciplines have expressed their fears of what will happen to their careers when they reach 50 or 60. Although that concern may be well-founded, as 20- 30 year olds tend to dominate creative and junior leadership roles, boards and director personnel are often much older, with the increased retirement age leading to a longer stay in the top roles, forming a glass ceiling above younger employees. Intrinsically, in order to keep creativity thriving, all industries benefit from a diverse workforce. This includes employing a mixture of ages and experience levels. Just as BAME or LGBT individuals bring new perspectives to the table, so do older employees. A blend is key to ensuring a varied viewpoint, rather than the oversimplified assertion that new is always better. Those in positions of power in organizations should also look to champion flexible models that create bespoke brief solutions for wider demographics. Taking this a step further, it cannot be left to the creative industries to lead this change. We may give it a wider audience, but it is a change of attitude for brands that will make permanent. By giving up a larger percentage of their efforts to diversify, brands can pressure the wider market, media and customers into rethinking their perception of age. So much depends on brave brands being ready to take a different approach and deliver to all their customers, instead of prioritizing a select few. Overall, real change will require a shift in the perception of older generations, from just an age bracket to a set of real consumer needs that need answering.